Gay adult leaders still barred from serving in the organization. 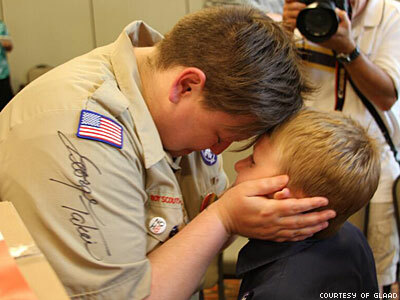 The Boy Scouts of America’s national council voted today to end the organization’s discriminatory policy barring openly gay youth from membership, reports the Associated Press. However, the group’s ban on gay adult leaders remains in place. For former members like James Dale, who was expelled from the organization in 1990 at age 19 after BSA officials learned he was gay, it is a hard-fought victory in a battle which has continued for more than two decades. His case, Boy Scouts of America vs. Dale, grabbed headlines in 1998 after an appellate court in New Jersey ruled that the BSA violated the state’s antidiscrimination law by expelling Dale because of his sexual orientation. Though the ruling was reversed June 28, 2000, by the U.S. Supreme Court in a 5-4 ruling saying private groups like the BSA have the right to set their own membership criteria, Dale believes his case helped pave the way for today’s landmark vote. “I lost by one vote in the Supreme Court, but I think that I pretty much continue to win in the court of public opinion,” he said in a recent interview with GLAAD. Since then, public disapproval of the BSA’s antigay policy has continually increased over the years, reaching a fever pitch in 2012. Even as the organization continued to expel employees such as former Eagle Scout Tim Griffin, who was fired from his job at a California Boy Scout camp because he was gay, and leaders such as Jennifer Tyrrell, who was ousted as a leader of her son’s scout troop in Ohio for being a lesbian, a wave of support for equality arose. Last year both President Barack Obama and Republican presidential candidate Mitt Romney said they opposed the BSA’s discrimination against gays, while groups such as the Intel Foundation, the BSA’s largest corporate donor, announced it would no longer fund the organization unless the its gay ban was lifted. By January of this year, mounting public pressure had forced the BSA to announce it would consider ending the gay ban and replace the policy with one which allowed local scouting organizations to set their own rules on the matter. However, a vote by the group’s national board set for February 6, 2013 to decide the issue was soon delayed until May, with the organization claiming the complexity of policy required “a more deliberate review.” National BSA officials then put forth the proposal voted on today, allowing openly gay young people in the program but still barring gay adults. Click through for more pictures leading up to the events in Texas today.